NORMAN PINSKI COME HOME represents the proof of concept for a feature-length comedy. After Norman is resurrected in the form of a classic horror film monster, the full version of the story follows his development as his parents attempt to guide him through the process of rediscovering himself. However, the Pinskis are somewhat aware that, as a young boy, Norman repressed his own aspirations in order to fulfill his father’s desire to join the family plumbing business. For the second go round, they come to a tentative agreement that Norman should get to be who Norman wants to be. But even with the best intentions, everything their reanimated son does seems to reinforce their own hopes. To Papa it seems like Norman really is interested in plumbing this time; but to Mamma, his primitive mind is just like a toddler but in the body of a monstrous hulk. Will Norman re-discover his true self? Will his parents finally learn how to parent? Will Norman ever learn to like his mother’s borscht? 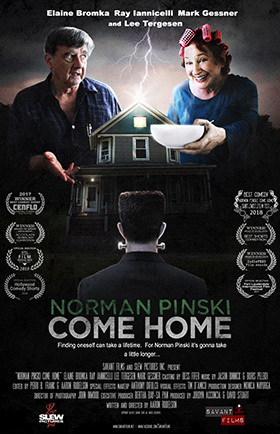 NORMAN PINSKI COME HOME is both a monster movie parody and a metaphor for adolescence; it’s a character-driven comedy about parents who want the best for their children; and it’s a story about self-discovery and second chances. The short film is a snapshot of the potential this project presents. Its remarkable success on the festival circuit is a strong indication of how far the feature version can go. NORMAN PINSKI COME HOME has screened in ten festivals across the country (in California, Utah, Florida, Ohio, New York). It won BEST COMEDY twice and earned nearly a dozen accolades from several film competitions. For additional information, please use the contact info at the bottom of this page.